This is the meal I choose when my husband is not home for dinner. 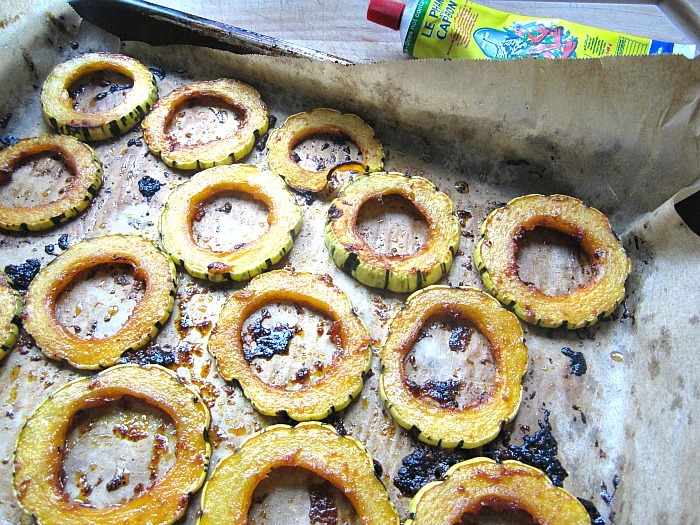 A simple dish to make, using spicy harissa paste which I love, and my favorite squash, delicata. Henry's comment lately is that he is "squashed out". 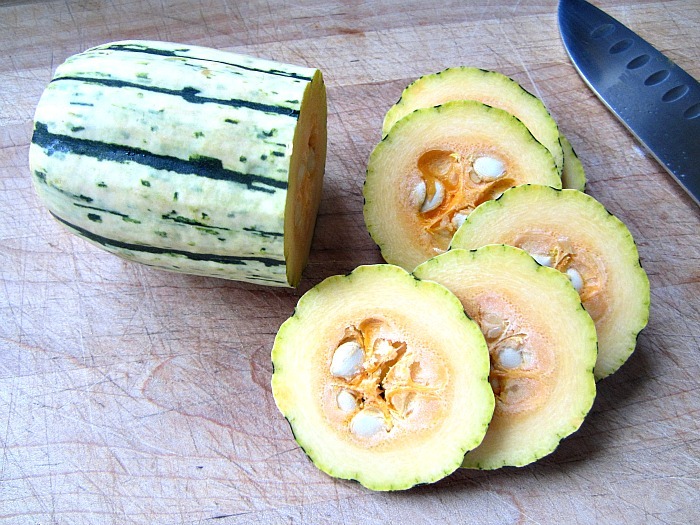 His request: "could I please not make anymore dishes with squash for a while?" Ok, so I will make squash when he is not home. This dish is pretty spicy, so if you are not a spice girl (or boy), then maybe change the dressing around a bit and use less harissa. I cut the dressing recipe in half, because I was only using 1 squash. You can use brown or green lentils, but lately, I love Idaho Black Beluga lentils the best, which I order directly from the company. Here's how to make this lovely vegetarian meal. Make the dressing and whisk with a fork. Set aside. Wash and drain the lentils and cook for about 20-30 minutes in salted boiling water. Drain and mix w/ olive oil some of the dressing. 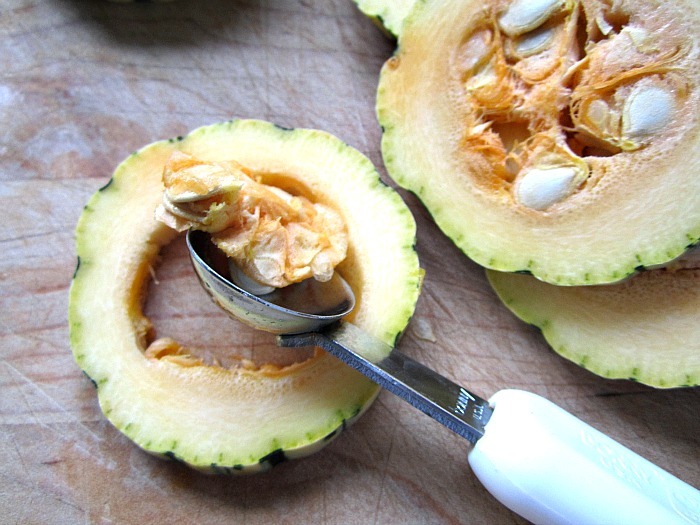 Slice and seed the squash, I use a melon baller to make life easy. Lay on a parchment lined baking sheet and brush with the dressing. Roast in a 400F oven for 20-25 minutes, turning once. 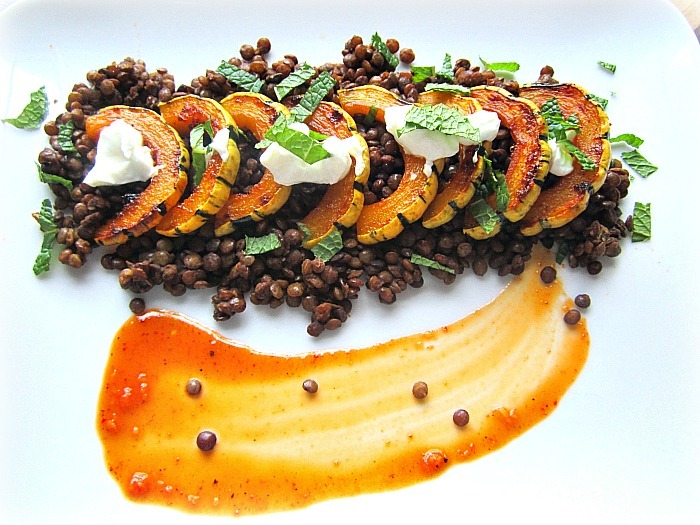 Serve the roasted squash over the lentils. Spoon some Greek yogurt (this cuts the heat and makes the dish even better) over everything and sprinkle with fresh mint. 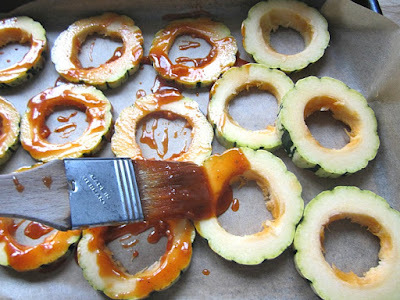 This is one of my favorite squashes too but I get a lot simpler. Cut it in half the long way, clean it out, smear with butter, sprinkle with seasoned salt and then microwave it. Fast and easy. What does Harissa taste like? Is it sort like a spicy cumin? Next time I go to the spice store I am going to try to remember to smell it. I like being able to buy small quantities of spices since they don't last long. Lovely dish Stacey -- too bad for Henry, but more for you!! I am one of those who haven't cooked yet with harissa, so I must get some and make this recipe. I was in Henry's camp, thinks please, no more squash recipes, until I saw the presentation! 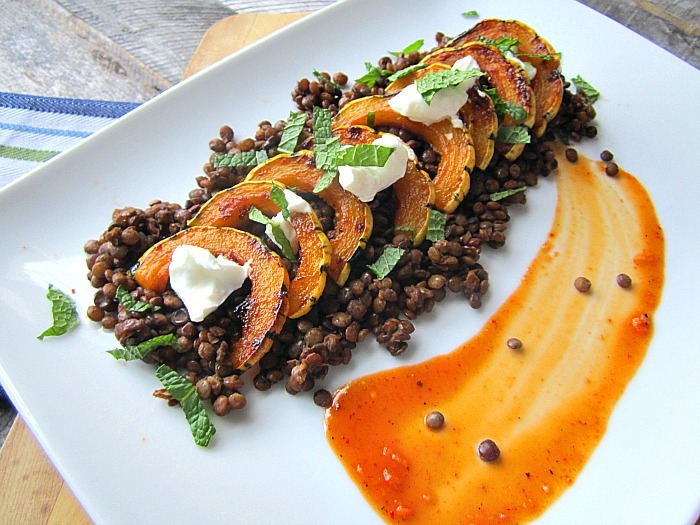 I can't get enough of any kind of squash, you can make so many things with it, I still have to make that cake of yours and now this with the lentils! "All squashed out"... I love it! Beautiful photo.